The topping combinations for this oatmeal are virtually endless. I love making this fully customizable recipe almost every morning for breakfast and it has yet to get old! I look forward to my bowl of oatmeal every morning and I am convinced that they will never get old for me. The topping combinations are virtually endless and you can make them sweet and even savoury too. Oats are also inexpensive and so easy to find. A major misconception when it comes to the vegan lifestyle is that "vegan food is expensive." I often hear this comment in conversations with veg-curious people and I see it all the time in comments posted across social media. The truth is that whole "plant-based" foods (not the processed ones!) are some of the least expensive foods out there. I always say that rice and beans will never be more expensive than a steak - even if you're buying organic. Oats are a versatile grain with many health properties. They are a great source of carbohydrates, in addition to being a good source of both soluble and insoluble fibre, meaning that they are digested slowly and will not cause your sugar levels to crash. Oats are also one of the richest sources of silicon, which is necessary for healthy bones and skin. I always add cinnamon to my oatmeal. Not only does it taste lovely, but is also a wonderfully healthful spice that helps battle candida (overgrowth of yeast), boost digestion and help relieve PMS symptoms. Cinnamon is also highly regarded for its ability to fight colds, arthritis and high blood pressure. You can totally customize the flavours in this recipe to your preference using your favourite spices. 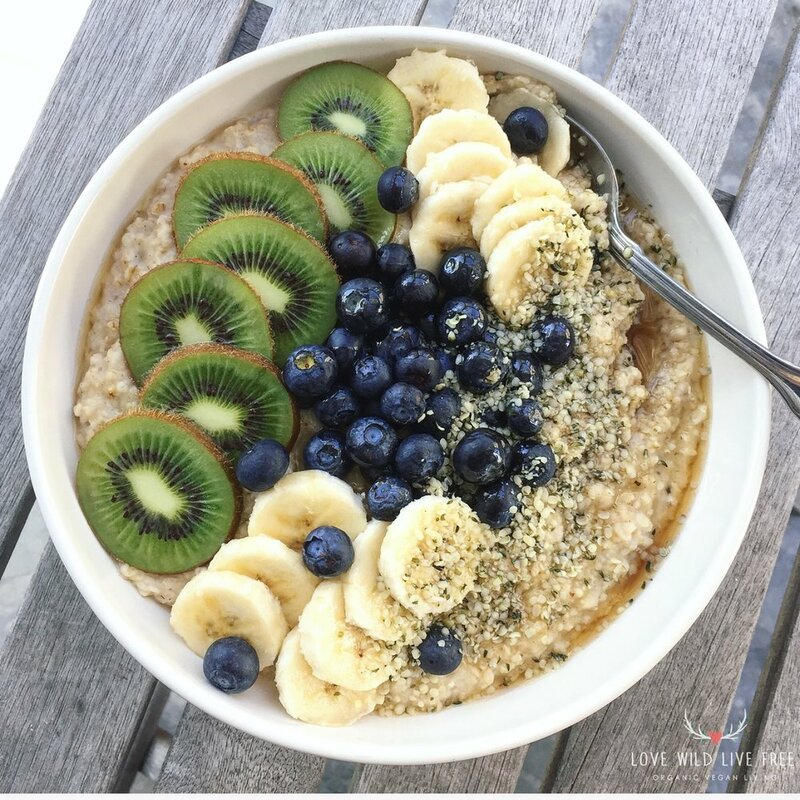 Quick + Easy Vegan Oatmeal topped with fresh kiwi, blueberries, bananas, pure maple syrup and Manitoba Harvest hemp hearts. Oatmeal is very filling and is quick and easy to make, which makes it a great breakfast option for when you're short on time in the mornings. The secret to making oatmeal really quickly is using "quick cooking oats". I just put my oats on the stove and they were cooked by the time I was done writing the paragraph above - within about 3 minutes! If you're looking for a similar recipe that can be made ahead of time and served cold when you're on the go, check out my recipe for Vanilla Cinnamon Overnight Oats - they are delicious and so simple to make! In the fall of 2014 I attended a cooking demo at Gluten Free Garage, hosted by Ashley Wittig, the owner of local Toronto Bunner’s Vegan and Gluten-Free Bake Shop. During the demo Ashley Wittig explained that oats are gluten-free by nature but are sometimes contaminated during processing or even in the field during production. If you are celiac or have a gluten sensitivity be sure to select oats that have a “gluten-free” label on the packaging. Also, .you don't need milk for creamy oats. I use water and my oatmeal always turns out creamy. 1. Combine ingredients in a small pot and bring to a simmer over medium heat. 2. Stir continuously until desired consistency is reached. Adjust heat as required. You can add more water if it gets too thick. Get creative and use your favourite toppings, the combinations are endless! I'd love to see how you make your oatmeal. Make sure to tag me on social media so I can check out your flavour and topping combinations! Find me at @LoveWildLiveFree on Instagram, Facebook, Twitter and Pinterest too! ** "10 Dairy Facts the Industry Doesn't Want You to Know." Free From Harm. N.p., 30 July 2014. Web. 21 Jan. 2017. <http://freefromharm.org/dairyfacts/>.